El Maravilloso Viaje del Longino, de Julio Ortega Ilabaca. - Universidad Católica Silva Henríquez, 2011. 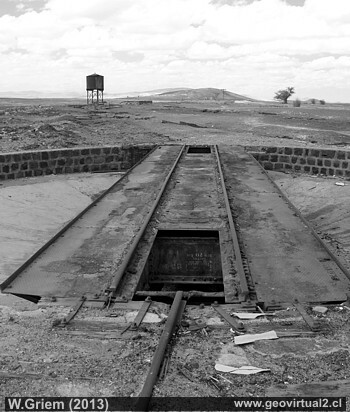 Introduction: The railway history of the Atacama region and Northern Chile . According to today's standards, it is hardly imaginable how a network of railway lines could have existed in this extremely depopulated desert. In general, this network was quite impressive, but it was mainly industrial railways. Many of the tracks were initially driven with pure horsepower and then converted to steam quite quickly. The British industrial dominance in the years around 1850 led to a solid extension of the first railway lines, with a track gauge of 1435 mm known to us, the common European standard. It must be noted that a profitable mining industry at that time (as it is today) could only be operated with an efficient way of transport. In the years from 1850 to 1930 this only applied to the railway. Horses and carriages could not guarantee a reliable and cost-effective ore transport. The railway lines, which were not connected to each other until the construction of the north-south line around 1914, had a considerable extension. Unfortunately, a large number of different track gauges were used in the end. 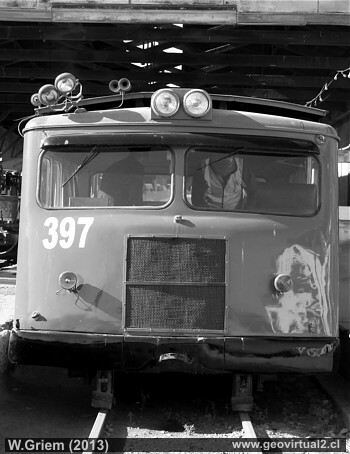 Passenger transport was extremely important for the demographic and socio-economic development of the Atacama region, but often not a good business for the railway companies. In addition, the dynamics of the mining industry (changes in prices, depletion of deposits, etc.) caused many expensive routes to soon lead uselessly into "nowhere". Villages were founded and after a few decades they disappeared again. Soon it turned out that many routes were no longer enough to cover the needs of industry and the population. With the construction of asphalted roads and the introduction of some scheduled bus connections or the provision of lorries, a competition was born that could not be denied. Passenger traffic was quickly transferred to the roads, and freight traffic soon followed. The lines were shut down for several years and were finally dismantled. The routes of Chañarcillo, Puquios, Jarilla, to name but a few, disappeared forever. Today (2016) this tendency continues (unfortunately). Only the routes Mina Colorado - Vallenar - Huasco and Chañaral - Potrerillos are still active. 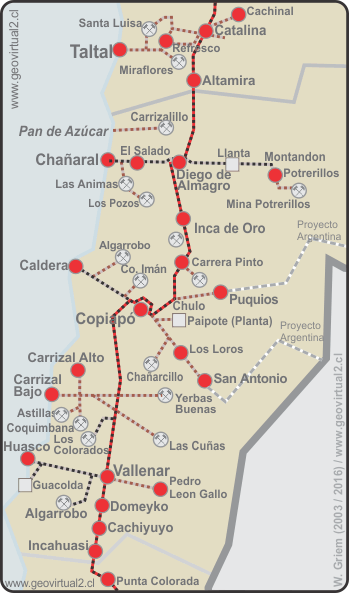 The tracks around Copiapó, Inca de Oro, Paipote etc. still exist, but the last curtain has already fallen. Not only does this mean that an investment worth millions from earlier times will vanish forever - a piece of industrial history will also disappear. In these pages, this part of the story is to be recalled. Old texts, plans and current views should reflect a little bit this, perhaps most impressive form of industrial influence on nature. The historical travel reports - especially about rail journeys - give the blurred perceptions a current reference. It should be noted that the Spanish pages are a little bit more extensive than the ones written in English and thus provide much more information.